"We wouldn't be here if it wasn't for that Tribe album." Sony Pictures Classics released the trailer for Michael Rapaport's new documentary about the legendary 80's hip hop group A Tribe Called Quest, which includes the likes of Q-Tip, Phife Dawg, Ali Shaheed Muhammad and Jarobi White. I'm not the biggest fan of their work, but I do like 'em. They definitely have some rad stuff out there. And this looks like a very cool doc. 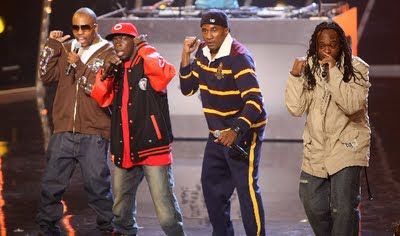 The film is titled Beats Rhymes & Life: The Travels of a Tribe Called Quest. It first premiered at Sundance and got pretty good reviews. If you're a fan, be sure to check out the trailer below. Beats Rhymes & Life: The Travels of a Tribe Called Quest was directed by New York native actor Michael Rapaport, who you know from True Romance, Deep Blue Sea, Special, Big Fan, Boston Public. He's making his feature directing debut with this doc. Sony Pictures Classics is bringing this film to limited theaters on July 8, 2011. Visit the official website.